There are a few above-average jokes in ANCHORMAN 2: THE LEGEND CONTINUES, but most of them are quite average. Underpinning the plot of a TV news anchorman struggling to find meaning in his job and love life, there is the cheeky indictment of the vapid 24-hour news culture and, by association, indictment of all those responsible for perpetuating it – you dummies. This saves the movie from being a crumpled, directionless ad-libathon. Once again set in the Swingin’ ’70s, Ron Burgundy (Will Ferrell) leaves his wife Veronica Corningstone (Christina Applegate) when the network chief (a grizzled, deadpan Harrison Ford) promotes her as the first female anchorwoman and fires him. A New York network producer (Dylan Baker) recruits Burgundy for a new concept – a 24-hour news channel. Burgundy: “That is the dumbest thing I’ve ever heard – news going round the clock? !” Called GNN (The Global News Network) and funded by an Australian entrepreneur (Josh Lawson), “We own the news – we can say what we want!” (cough-Rupert Murdoch), it’s starting to look dangerously close to FOX marrying CNN. Like a League of Retarded Gentlemen, Ron assembles his news team that had gone their separate ways: aggressively-gay-for-Burgundy Champ Kind (David Koechner), managing a fast food chicken store that served fried bat; sexual panther Brian Fantana (Paul Rudd), working as a kitten photographer; and thick-as-a-Brick Tamland (Steve Carrell), who was dead. Strangely enough, just by being their dumb selves, Ron’s news team spikes the ratings (“It’s crap but they can’t stop watching!”), but when Veronica on the competing network scores an interview with Yasser Arafat and threatens to usurp all their viewers, Ron must up the ante. When Ron is told, “Speculate on who’s driving the car,” we’ve arrived at CNN. Meagan Good plays a badly written and badly acted producer. We know it’s the ’70s, but there are still innumerable problems in the way the filmmakers portray her seducing Ron and then later knocking him out. For example, stating that you “grew up with five brothers” might give you backstory on why you can fight, but that doesn’t give you license to knock someone out in front of numerous witnesses for verbally insulting you, especially if it’s a double-standard woman-on-man knockout (i.e. think of how offensive it would be were it the other way ’round?). There might be numerous wink-wink politically incorrect jokes about the outdated manner women were treated in the ’70’s, but why isn’t it seen as politically or just ethically incorrect to hit a defenseless man? Written by Ferrell and Adam McKay, and directed by McKay, released 9 years after its predecessor, ANCHORMAN 2: THE LEGEND CONTINUES is a stream of disjointed jokes and ad-libs peripherally or hardly related to the plot. Each bit is unevenly funny (like the original), and as usual the gag reel is funnier than the movie. An example of an uneven gag: the crack smoking bit. After Ron’s team toke on air, we cut to the punchline shot of them being uncuffed while on the street, with Ron concluding, “Well, now we know you can’t smoke crack on TV.” Mildly funny, mostly perplexing. If we imagine the scenario, we can presume they were chased out here, tackled and cuffed before this scene, but to achieve this shot, the producers had to dress the whole street and light it for a night shoot (which is harder than a day shoot), including wetting it down, organizing background action and extras, including cop costumes, a prop cop car, the rights to film at that fountain, etc. Couldn’t they have donated this money to a museum or cancer foundation, instead of waste it on a joke that could have worked just as well if they were being uncuffed on the studio floor? The audience watching Ron’s “entertainment news” is shown to be all rednecks. But let’s face it: anyone who subscribes to this hijacking of quality media is being a redneck in mind and body. WE ARE RESPONSIBLE for what ultimately seeps through to our square eyes and numb brains. Says Ron, “Why tell them what they need to hear? Why can’t we tell them what they want to hear?” And isn’t that how this crap fest started rolling downhill like a trolley with no brakes? As in ANCHORMAN (2004), the best bit is the gladiator battle between the news networks, with “no touching of the hair and face.” Featuring power cameos by Sasha Baron Cohen for the superior BBC, Jim Carrey and the incredibly polite Canadian News Team, Liam Neeson for the History Network (replete with minotaur and John C. Reilly as The Ghost of Stonewall Jackson), Amy Poehler and Tina Fey for Entertainment News, Will Smith for ESPN, Kanye West as an anachronistic MTV VJ, and – wait for it! – Vince Vaughn reprising his Wes Mantooth (I die laughing just thinking about that name). Strangest aspect of this biting movie is that entertainment news networks (which is – let’s face it – all of them) embrace Ron Burgundy as a compadre, as if he is promoting their existence as worthy. Either they have a really good sense of humor, or they are, in fact, as dumb as ANCHORMAN 2 makes them out to be. As I watch another interminable car chase on a major news network… I’m guessing the latter. 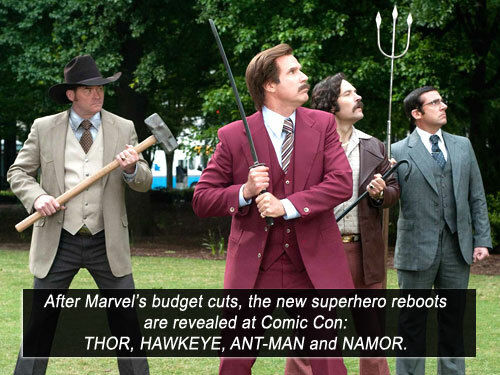 aka: ANCHORMAN II: THE LEGEND CONTINUES. Writers: Will Ferrell, Adam McKay. Starring: Will Ferrell, Steve Carell, Paul Rudd, David Koechner, Christina Applegate, Dylan Baker, Meagan Good, Judah Nelson, James Marsden, Greg Kinnear, Josh Lawson, Kristen Wiig, Fred Willard, Chris Parnell, Harrison Ford, Bill Kurtis, June Diane Raphael, Jim Carrey, Tina Fey, Liam Neeson, Amy Poehler, John C. Reilly, Vince Vaughn, Kanye West, Brian Steele.